Spring arrived just a couple weeks ago, and although the weather at times can be confusing, it can also be very beautiful too! Daffodils and tulips are growing and adding much needed color to the area, even if at times they have a dusting of snow collected on them. 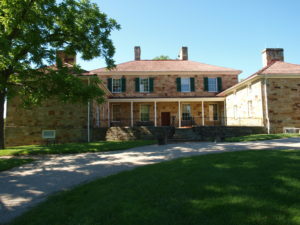 • Adena Mansion & Gardens, open Wednesdays through Sundays. You can spend hours exploring the grounds of Adena, the estate of Thomas Worthington. During your visit you’ll have the chance to explore the Education Center which has interactive exhibits to give you a better understanding of life in the 19th century. Your tour of the mansion will transport you back in time and allow you to truly see how life was like for the Worthingtons and their staff. The rest of the grounds, gardens and outbuildings are all self-guided so you can take your time to explore. • Ross County Heritage Center, open Tuesdays through Saturdays. The Heritage Center gives you the traditional museum experience that showcases many eras of Ross County and Chillicothe. From the moment you step into the museum, you know you will see some exciting exhibits. 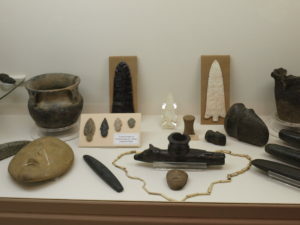 Some of the permanent exhibits include antique vehicles that were used in day-to-day operations during the early days of Chillicothe, an extensive collection on Camp Sherman (the third largest training camp in the U.S. during WWI), Native American artifacts, and even vintage toys and dolls. • Lucy Hayes Heritage Center, open Fridays & Saturdays. This is the birthplace of Lucy Webb Hayes, wife of the 19th U.S. President Rutherford B. Hayes. During your visit to Lucy’s house, you’ll not only discover history of the Hayes, but learn about the efforts it took to save this historic house. Some of the information that you’ll find out while visiting is how Lucy earned the nickname “Lemonade Lucy”, that she was the first wife of a president to be called the “First Lady”, and all of her charitable work. No matter what season, you can always explore the beauty of southern Ohio and the foothills of the Appalachian Region. You can also find both history and beauty at Hopewell Culture National Historical Park. • Hopewell Culture National Historical Park (HOCU), open year round. 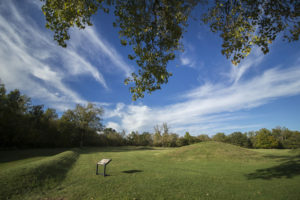 HOCU operates five-sites as part of the park: Mound City Group, Hopeton Earthworks, Hopewell Mound Group, Seip Earthworks and High Bank Works. The best known is Mound City Group where the park’s visitors center is located. These sites have huge, geometric earthworks that were built by these ancient peoples, dubbed the Hopewell Culture, over 2,000 years ago. Not only are these earthworks magnificent in size but they have many ties to solar and lunar occurrences. Because of their incredible value in archaeology and ancient cultures, these sites are part of the Hopewell Ceremonial Earthworks working towards achieving inscription as a World Heritage Site. Such inscriptions are held by the pyramids in Egypt, the Grand Canyon, the Great Barrier Reef in Australia, and many other significant sites from around the world. • State Parks and Trails, five State Parks within Ross County and over 120 miles of trails to explore. Taking in the beauty of southern Ohio can come easily through by visiting any of the State Parks. There’s a variety of trail options allowing for a family-friendly exploration to a more intense trail for those who are well conditioned. There’s something for everyone to do in Ross County. Whether you enjoy historical sites, outdoor recreation, entertainment, tasty food or unique shops you can find a long weekend getaway that’s best for you.